The application form for the outing to Chatham's Historic Dockyard, Upnor Castle, etc, was included with the last Newsletter. For further information or late comers, please contact Jim Nelhams (see the last Newsletter page for his details). On the last page of this Newsletter you will find the details and a cut-out booking form for our outing on Wednesday 17th August to the Roman Villa excavation at Folkestone and other interesting places – see pages 2 and 3 for much more information about the fascinating villa site. HADAS are having a buffet lunch party to celebrate their first 50 years!! The event will take place at Avenue House, 17 East End Road, London N3 3QE, on Sunday 7th August 2011 at 12.30 for 13.00. This will be a great opportunity to catch up with friends and make new ones. As well as a buffet lunch, an exhibition of the items from the Moxon collection, a raffle and a recording of the first lecture by our founder Themistocles Constantinides in 1961 will be part of the proceedings. If you haven’t already told us you are coming please contact either Jo Nelhams (email secretary@hadas.org.uk or telephone 0208 449 7076) or Don Cooper (email chairman@hadas.org.uk or telephone 0208 440 4350), or write to our addresses on the last page of this Newsletter by the middle of July so that proper catering arrangements can be made. At the AGM I managed to collar one new Editor for the Newsletter, but more are needed, most particularly as a reserve. Just once a year, each Editor puts together one Newsletter, using information and reports sent to them and a general format (which will be written down shortly for newcomers!). If you are just thinking about volunteering and want to know more please e-mail or phone (mary.rawitzer@talktalk.net 020 8340 7434). The re-excavation of the East Wear Bay Roman villa, Folkestone Kent CT19 6PU. OS TR240369. Excavation 2010/2011 by Canterbury Archaeological Trust working with Canterbury Christ Church University and the Folkestone People's History Centre - with reference to the 1924/5 Stuart Winbolt excavation funded by Folkestone District Council. This is a huge 30-room winged Roman villa, overlaying an earlier simplified dwelling, which can favourably be compared to that at Nenning, Germany, and dates between early 2ndC AD and mid- 4thC. It may have been even more extensive if in fact it had two storeys, as suggested by two slip, possibly stairwell, rooms. It also had a separate 20-room bathhouse. Both were fully excavated by Stuart Winbolt in 1924/5. Winbolt credited his interest in the villa to his conversations with Mr Peden, the octogenarian Assistant Curator of Folkestone Museum, in 1923. There had been some small-scale excavations in the 19thC following recorded finds from 1860, but nothing on the scale of the Winbolt excavation. After discussions, Folkestone District Council funded the two-year digging programme and also provided the labour force and abundant assistance. Stuart Winbolt must have been excellent at delegation, as his 200-page book complete with black and while plates, drawings etc., and accompanying short notebook, were actually published the year his excavation ended in 1925. On the first page of his book “Roman Folkestone” the very professional plan of the villa is actually the work of the Borough Engineer who also seems to have been instrumental in persuading RAF Manston to take the necessary aerial photographs. Amazingly Winbolt notes that some of the bathhouse walls he uncovered stood at 6 ft. A second reading of his book made me appreciate his knowledge and the thoroughness of his investigations. I visited the site with my sister on one of the last days of the new excavation, between showers, on a cold October afternoon in 2010. The location is in a beautiful country park on the edge of a sloping cliff, facing south-east across the English Channel towards Cap Gris Nez, the shortest crossing to the continental mainland. I have to admit my bias, of course, as Wear Bay Road was my childhood home. The villa is between the Napoleonic Martello Towers 1, 2 and 3 and below the high cliffs to the north of Capel le Ferne, site of a possible Roman Signal Station. In Roman times the villa may have stood up to half a mile inland. The grey Gault clay/chalk sandwich is unsuitable for long term building and the cliff edge would have always been crumbing. It is, and was, exposed to the terrible winter storms and huge waves that are part of Folkestone‘s fame. Even Leland was aware of this in the 15thC when he was told by the residents that two whole parishes that they can name had been washed away long before their time - possibly in the early 14th Century's “biblical storms“, or even earlier. Further damage has been inflicted by the building of the harbour and its arm, to the south, during the early 19thC, preventing the East Cliff receiving the longshore drift of protective shingle making its way round the coast. Since 1925 the distance from the edge has decreased from 30metres to 2½ metres, the collapse taking with it some of the bathhouse and destroying the freshwater fish ponds beneath the cliffs. The villa fell into disrepair during WW2, as front line defence became the first priority. Dreadful tales of local lads using the mosaic as catapult fodder, and worse, were told to me in my younger days by neighbours who had lived through those years. In 1957, as a very disappointed 8-year old, I watched as the villa disappeared into the earth as council workers reburied it. The site had more use to them as a car park for the local beaches below the cliff. Since then, apart from a small scale excavation of the bathhouse by the county archaeologist in 1989, the remains of the villa have been undisturbed. It was very exciting for me, personally, to visit the new excavation, and see the villa once more unveiled, perhaps for the very last time due to erosion of the Cliff. Winbolt's excavation concentrated on the villa and bathhouse identified by the aerial photographs. His finds included a large mosaic room, painted plaster, large ceramic drain pipes, pottery and coins. Perhaps his most important discovery, depending on your own perspective, was the two CL BR tiles datable to between 43AD and 287 AD, evidencing the presence of the Classis Britannica, the Roman navy in Britain, linking to similar finds in Lemosis, Anderida and Boulogne. The Roman artefacts and coins found dated between 100 and 350 AD. There were also Iron Age artefacts and coins, some of tin, dated from 100BC to 50 AD and three Iron Age Burial Urns dating between 1AD aand 50 AD were found beneath the villa. The new excavation has also gone below the villa and also further to the north, outside the walls. Canterbury Archaeological Trust (CAT) found prehistoric artefacts dating from the Mesolithic. Botanical sieving also took place - unlike in Winbolt's time when soil was unceremoniously wheel- barrowed over the cliff edge. Significant new discoveries also included an Iron Age drainage ditch with evidence of a possible timber roundhouse, 13 Iron Age coins 150BC-50 AD, plus Dressel 1 amphora. CAT interpret these as indicating wines imported to a high status site and conclude it may have been a Roman client site as at Fishbourne. CAT’s finds also give earlier Iron Age dating then those of Winbolt. The Villa, famous once, splashed all over The Times in August of 1925, hardly rates a mention in new books on Roman Britain. These new investigations will put it back on the map. This year possibly the very final excavation will commence in July and will focus on uncovering the walls with a further new focus on the courtyard. Those going on the HADAS trip should have a memorable visit. The Society’s 50th Annual General Meeting was held on Tuesday 14th June 2011 at 8pm in Avenue House. The Chairman, Don Cooper, introduced the President, Harvey Sheldon, who chaired the meeting. There were 33 members present and apologies were received from a further 10 members. The Annual Report and Accounts were presented to the meeting. The Treasurer showed that there was a shortfall between the current subscription and the basic costs of running the Society, though it is financially sound due to the legacy left by Ted Sammes. Various points were made as to how to close this gap in income and expenditure and members were asked to submit any suggestions to the Committee for further discussion. The Officers remained unchanged and were duly elected. Nine members of the Committee offered themselves for re-election and were also duly elected. Porges, Mary Rawitzer, Andrew Selkirk, Tim Wilkins, Sue Willetts. The Chairman explained the circumstances that led to the withdrawal of HADAS from the proposal to be involved with the running of Church Farmhouse Museum. The museum is now closed and its future is unknown. He said HADAS would continue to monitor the situation and endeavour to keep it in the public eye. Harvey Sheldon said that the manner of its closure, and the lack of a local museum in Barnet, equivalent in population to a small town, should and would be taken up by LAMAS (London & Middlesex Archaeological Society) in which he and Don were both involved. Themistocles Constantinides, which was very entertaining and informative and was well received by all who heard it. (For those who missed it, there will be a further chance to hear it at the celebratory party on August 7th). 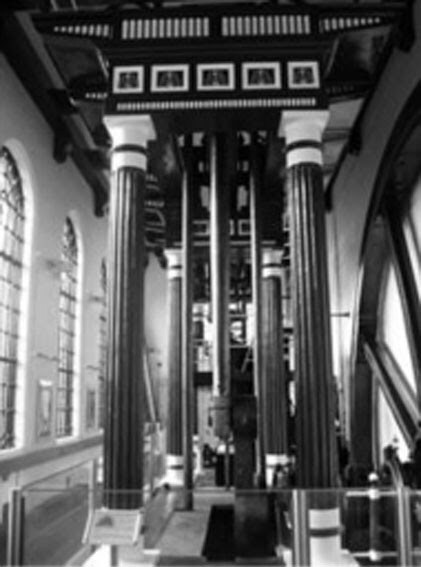 The history of the rescue and restoration of a beam engine used to pump sewage in Tottenham was the subject of a very interesting talk given by Ken Brereton on 10th May. In the early 19th century, Tottenham was still a small rural village, but by the mid-1840s rapid expansion was causing serious public health problems due to sewage being discharged into local rivers, the Moselle and the Lea. In 1850 the newly formed Local Board of Health set up a public water supply and sewage disposal works. This was at Markfield Road, Page Green. The initial works consisted of a 45hp steam engine to lift the incoming sewage and discharge it into two deposit tanks. The effluent would then flow to the sand filters alongside. On leaving the last filter bed the clear liquor would pass down the effluent race to the River Lea. The site included two workmen’s cottages. This worked well until 1858 when further population growth left sewage overflowing into the Lea. By 1866 the situation was so bad that Tottenham was accused of causing the deaths of 4,000 people in a cholera epidemic. Some minor improvements, including a new sewer at Hornsey, alleviated some problems, but as the population increased still more in the 1870s things became worse again. Meanwhile in London Bazalgette had built his great system of sewers that took sewage away from the city and discharged it further down the Thames. In 1885 the Lea was badly polluted, and it was decided that a larger pump and larger settlement tanks must be built. Wood Bros of Sowerby Bridge, Yorkshire, received the contract to make and build the engine. By January 1886 the engine house was completed and all parts of the engine were on site. On the 12th July 1888 the 100hp engine came into use. The total cost of the engine and foundations was £4722. When running at 16rpm the engine pumped up to 4 million gallons of sewage in a 24 hour period. In 1893 the Lea was declared clean. In 1905, triple expansion Worthington engines were brought in, and the beam engine was relegated to standby duty for storm water pumping. During the Second World War, the site was still in operation. The land contained a pig farm, which remained until the early 1960s, but in 1964 the site was finally closed, when incoming sewers were diverted elsewhere. The engine house, containing the beam engine, was bricked up. Apart from a small building used for children’s activities, the site became a dumping ground. In 2002 Haringey Council began to landscape the site to turn it into a park. From 2006, with help from the Heritage Lottery Fund, the engine house was refurbished and volunteers worked on restoring the beam engine, and in 2010 the engine was again in steam, but now using oil, not coal to fire it. The Markfield Beam Engine and Museum, at Markfield Road, Tottenham, is open on the second Sunday of each month from 11:00am to 4:00pm. Steaming dates this summer (2011) are on July 24th and August 29th. In 2010 Birkbeck College excavated an area of land immediately north of the Bridgettine church which now lies beneath the eastern lawns of Syon House. Extensive stone foundations, including parts of the nuns' cloisters and range of buildings, were discovered to the east and north. A large quantity of 15th and early 16thC painted glass fragments was also found, depicting lettering, architectural images, figures and a representation of the crucifixion. A geophysical survey on the front lawn revealed two further courtyards beyond the front of the house, extending as far as the still-existing "Pepperpot Lodges". This will be Birkbeck's focus for its 2011 training digs running from Monday 4th to Friday 8th July and again from Monday 11th to Friday 15th July. Most people looking for a training dig will already be aware of this and the places are usually filled rapidly, but to enquire about possible participation visit contact the course team: certhe.archaeology@bbk.ac.uk or phone 020-7631 6627. Course cost ranges from £225 to £600, depending on concessions. Step back in time to witness an epic clash of the titans in Guildhall Yard, the site of London's only Roman amphitheatre. Hear the roar of the crowd and imagine the sand of the arena beneath your feet as fearsome gladiators dramatically reconstruct games once held in ancient Londinium. Experience Roman Londinium; interact with senators, slaves, soldiers, musicians, and surgeons. The event aims to present a realistic portrayal of combat in the Roman amphitheatre and as such contains of graphic violence and simulated bloodshed - may not be suitable for younger children! Sat/Sun 2nd/3rd July 12-7pm East Barnet Festival. Oak Hill Park, Church Hill Rd, East Barnet. Lots of community stalls, including Barnet Arts CCL. Sun 3rd July 3-5pm Bothy Garden Open Day Avenue House grounds, East End Rd. N3 3QE. Thurs 5th July 2-3pm Streams & Walks in Harrow. Harrow Museum, Headstone Manor, Pinner View, North Harrow. Talk by Dr Freddie Hicks (Stanmore & Harrow Hist. Soc.) £3. Sat/Sun 9th/10th July Pentland & Finchley Festival Victoria Park, N3. Tues 12th July 8pm A History of the Earth in 9,400 Objects: The collection of Dr John Woodward (1665-1728). Amat. Geol. Soc. St Margaret's Church, Victoria Ave N3. Talk, D Pemberton (Sedgewick Mus.). Fri 15th July 12-2pm Archaeology Up Close: handling session with members Museum of London London Wall. EC2. 2-2.30 or 3-3.30 Roman Fort Visit. Both free. Fri 15th July 7-9pm Elizabethan London: Guided Walk. COLAS. Led by John Gibson (City of London guide). Start outside Royal Exchange nr. Bank Station EC3. Tues 19th July 2-3pm Confessions of a Curator Harrow Museum Talk, Jason Finch (Manager). £3. Thurs 21st July 7.30 English Heritage Listing in Camden Camden History Society Burgh House New End, NW3. Talk by Emily Gee. Wed 20th July 7.30pm Visit St Mungo's, Pound Lane, NW10 Willesden Local History Society. Meet entrance opposite bus garage. Led by David Rose. Tues 26th July 10.30am St Andrew's Church and its Personalities Talk by Janet McQueen Enfield Society, Jubilee Hall, 2 Parsonage Lane, junction Chase Side, Enfield. Wed 27th July 3-4pm Meet the Expert Museum of London Ian Blair, MOLA. Free.